Nemeth Alexander Stephen, W.O., C.D., 82, of North Grant, Antigonish County, Nova Scotia, passed away on September 1, 2012, in St. Martha’s Regional Hospital, Antigonish. Born in Raymond, Alberta, he was a son of the late Alexander and Sarah (Tassi) Nemeth. 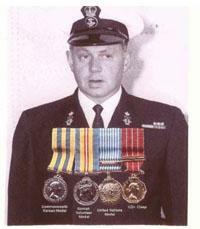 He was a veteran of the Korean War, having served with the Royal Canadian Navy. He also worked for 17 years with the Department of Fisheries. His favourite hobby was restoring military vehicles and weapons, of which he had a large collection. He was also an avid hunter and fisherman. He is survived by his daughter, Joan (Melvyn) Currie, Middleton; sons, Carl, Indian Brook, Ron (Deborah), Pinevale, Gordon, Tampa, FL, Bruce, Antigonish; brother William, Raymond, AB; 6 grandchildren and 10 great grandchildren. He was predeceased by his brother, Kelly, and sisters, Elizabeth Laczko and Helen Nemeth. Cremation has taken place. There will be no visitation or service. A reception for family and friends will be held at a later date. In Memoriam, donations to VON Antigonish appreciated.